The inaugural Nitro World Games is set to go down in the summer of 2016! With X-Games FMX almost non-existent now and the Red Bull X-Fighters series going down to one stop for 2016, Travis and the Nitro Crew have stepped up to fill the void and are going top be holding a new style of action sports contest that has the potential to be beyond epic! SALT LAKE CITY, UT (Monday – December 7, 2015) – Nitro Circus (www.nitrocircus.com), NBC Sports, Utah Governor Gary R. Herbert and the Utah Sports Commission today announced the inaugural Nitro World Games coming to Rice-Eccles Stadium in Salt Lake City, Utah on Saturday, July 16, 2016. 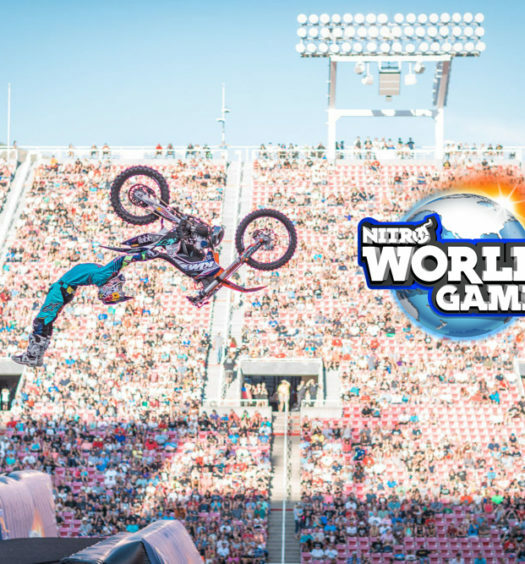 The biggest event in the history of action sports, the Nitro World Games is a riveting three-hour experience – airing live in the U.S. on NBC during prime time – that marks a revolutionary transformation of action sports competition. Created by extreme sports icon Travis Pastrana with Nitro Circus CEO and Creative Director Michael Porra, the Nitro World Games will feature the best athletes from across the globe in action sports’ most exciting and popular disciplines, including freestyle motocross (FMX), BMX, skate, inline, scooter and more. “Action sports have been a key part of Utah’s sports infrastructure, and we look for opportunities to grow this space,” said Jeff Robbins, president and CEO of the Utah Sports Commission. The Nitro World Games will host the world’s biggest stars and the most accomplished athletes in action sports. 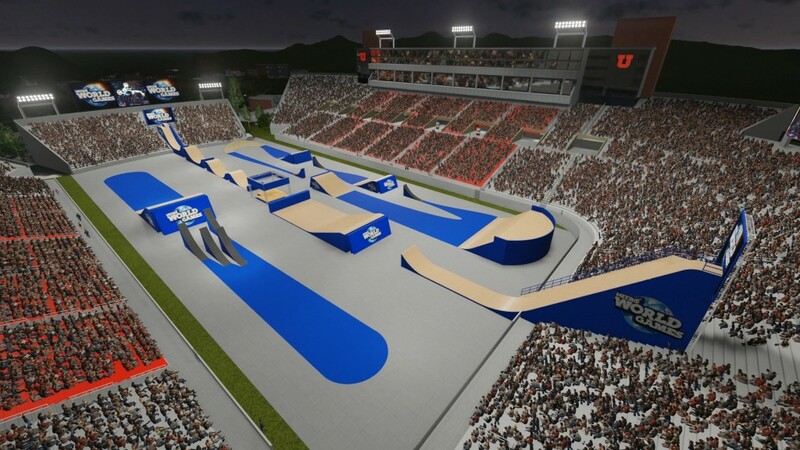 It will also feature new disciplines, formats, tricks and all new ramps along with a Nitro-invented live scoring system ensuring fans can totally engage with the competition during every single minute of the Games. Each event will be a final round with everything on the line. Riders will attempt awe-inspiring — and in many cases brand new — tricks, all of which will create intensity on the track, energy in the stadium and must-see television for viewers. Independent and legendary veterans of each discipline will judge the fierce competition with pre-agreed degree of difficulty for every trick, ensuring the fairest and easiest to understand scoring system ever developed. Every action sports athlete in the world is eligible to compete in the Nitro World Games. Riders can attempt to qualify through preliminary events to be held at the Nitro Circus Academy of Excellence at Woodward West and at Travis Pastrana’s “Pastranaland” complex in Maryland U.S.A. Finalists will participate in the epic main competition at Rice-Eccles Stadium on July 16. Also, Pastrana will lead an old school FMX throwdown in the Travis Pastrana No Rules Freestyle Legends Event. Pastrana’s brainchild, this goes back to the core of FMX, where riders challenged each other to hit any terrain and jump off any object, simply to see who could land the most outrageous trick. Pastrana will personally design the course and select the competitors from among the biggest icons in the sport. A panel of judges will rate each run. They will not give out scores, but rather simply decide who will earn the honor of the gnarliest rider on the planet. As fans would expect from Nitro Circus, the Nitro World Games will feature a massive production, with over 15 different ramps – including Nitro Circus’ trademark 50-foot Giganta Ramp and the biggest setup in the history of FMX Big Air – filling the stadium floor, plus pyrotechnics, state of the art replay screens and more. Fans both in the stands and at home will be blown away. NBC Sports will present three hours of live coverage of the Nitro World Games in the United States, with the telecast starting at 8 p.m. ET on NBC. All coverage shown on NBC will also be streamed on NBC Sports Live Extra, NBC Sports Group’s live streaming product for desktops, mobile devices, tablets and connected TV’s. Outside of the U.S., NBC will distribute the Nitro World Games on leading networks globally via tape delay.